The EL6224 IO-Link terminal enables connection of up to four IO-Link devices, e.g. actuators, sensors or combinations of both. A point-to-point connection is used between the terminal and the device. The terminal is parameterised via the EtherCAT master. IO-Link is designed as an intelligent link between the fieldbus level and the sensor, wherein parameterisation information can be exchanged bidirectionally via the IO-Link connection. The parameterisation of the IO-Link devices with service data can be done from TwinCAT via ADS. 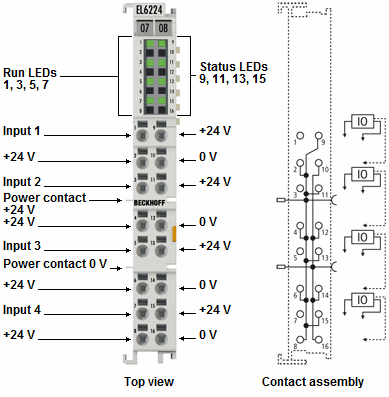 In the standard setting, the EL6224 functions as a 4-channel input terminal, 24 V DC, which communicates with connected IO-Link devices, parameterises them and, if necessary, changes their operating mode. So far, the EL6224 has been manufactured in the standard housing with eight connection points. Integration into the HD housing with 16 connection points now enables each IO-Link device to be operated in 2-wire connection mode (so-called physics 1) or 3-wire connection mode (so-called physics 2). The direct plug-in technique enables toolless construction. subsystem For further subsystem products please see the system overview.